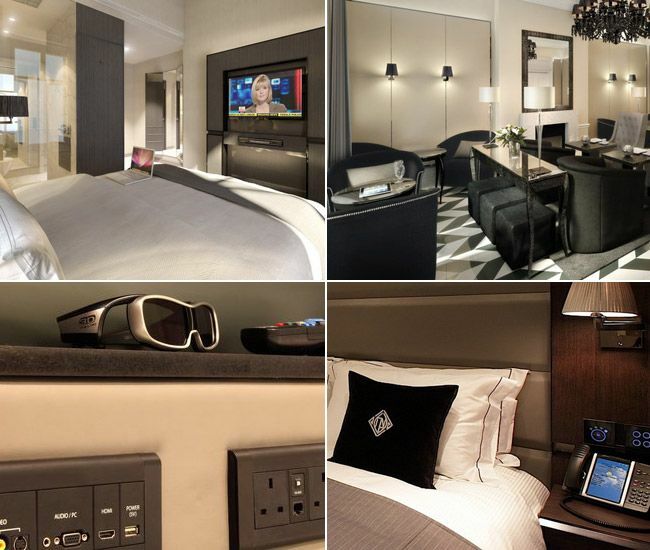 LUXURY BOUTIQUE HOTEL, LONDON'S #HI-TECH HOTEL! Eccleston Square Hotel has opened as London's most High Tech hotel and is a proud member of #Design Hotels. Bordering Belgravia in the heart of Central London SW1, our London boutique hotel sits on an award-winning garden square, close to creative and chic fashion shops, galleries and a myriad of stylish restaurants and bars as well as famous landmarks such as Buckingham Palace. An iPad 2 in every room. Order room service - 24hr dining options at your fingertips. Browse the library of complimentary 3D DVDs and request one to be brought up to your room. Request an in-room massage or a fitness session with our personal trainer. Book a table at one of London's hot clubs. Access exclusive concierge services - Giving our guests access to the inaccessible. L'Occitane Pillow Mist – A light mist to spray over your pillow to encourage sweet dreams and a peaceful nights rest. Cleverly switching from clear glass to opaque - giving you as much privacy or light as you wish. There is no better start to the day than with the ultimate shower experience - Rainfall shower, high pressure wall shower and handheld massage shower. The XXL fluffy towels and custom bathrobes are the ultimate luxury. An Anti-Mist Mirror with integrated LED TV in the mirror so you don't miss the headlines whilst you are brushing your teeth. A personal mini bar with hand picked artisan products at groundbreakingly low prices - enjoy guilt free. Nespresso Machine – choose from a selection of complimentary Nespresso capsules all with different aromas for you to enjoy. Our guests can also choose to enjoy our selection of fine teas. These will be replenished during your entire stay. Keep yourself well hydrated and enjoy a large complementary bottle of Evian water, replenished every day. For added comfort each room has eco-friendly under floor heating fitted in the hallway, bedroom, and bathroom to keep the floor at a comfortable temperature. There is no better TV then the latest Panasonic 46" Inch Full HD 3D NeoPlasma TV that we have supplied in all the rooms, well regarded worldwide as the champion of picture quality. You will also have access to Sky 3D & their full range of channels including HD Movie channels, Sky News HD & Sky Sports HD & 3D. Guest will also be able to select from our library of complimentary 3D Blu-ray discs to enjoy in the comfort of their own room directly from their iPad2. 4 UK sockets with European adaptors are provided, 2 US 110 V sockets, 2 USB chargers, HDMI & RGB. 2 pairs of active 3D Panasonic glasses can also be found in each room - These are currently the latest 3D glasses on the market and can also be worn over a pair of normal viewing glasses. The 'Do Not Disturb' button is located right by your bed, so you don't even need to get up to activate it. The button switches off your doorbell and activates a discreet privacy light outside your door. 2 key holders guarantee that you and your partner have a convenient slot for your key and also ensure that the power supply to your room remains switched on should one of you chose to leave. In your room, you will receive a stunning set of complimentary L'Occitane products from Provence, South of France - These products are all 100% natural and are just divine. Wrap yourself in our luxuriously soft bathrobes & slippers made from 100% Egyptian cotton. Don't get wet - Eccleston Square Hotel umbrellas are stylish and extremely durable, able to withstand all kinds of British weather. The SPG App will exploit Google Glass capabilities for hands free, voice activated questions - directions, call the hotel, view photo galleries, etc. The GoogleGlass app + other wearables such as smartwatches will open a whole new spectrum of guest services. What traveler services can you imagine? +Cool Hunting a terrific job of profiling the DNA of +citizenM hotels - as a loooong time hospitality professional, I absolutely agree engineered hotel experiences are outdated. "The original name was 'One Star is Born,'" says Chada. "It was our code name, because we didn't believe in the star rating system, which is very old-fashioned. It's not about the actual amenities and more about the service and experience that you get." A worthy read...travelers will relate + hoteliers take notice. I am a big fan and follower after my Citizen M Hotel Amsterdam stay. 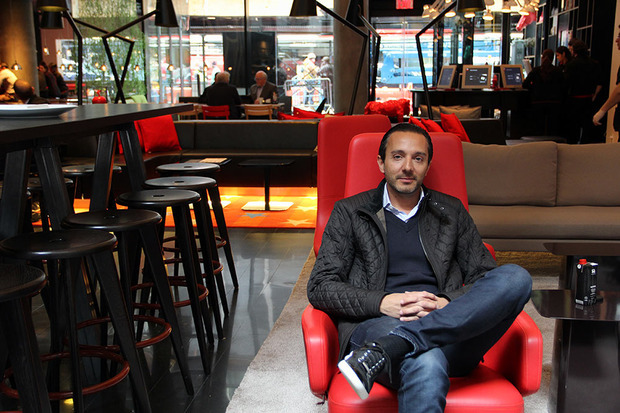 +citizenM hotels totally gets it - focus = guests as global mobile nomads + local flair. The #NYC #TimesSquare CitizenM hotel opening was a successful alchemy of social brash blogger slumber party + cheeky traditional bell hop in front rival hotel + fun, funky art from Jon Burgerman to - my favorite - 'no hotel cliches' stop motion video. Congratulations #CitizenM Hotels on your brassy creative approach that is so Noo Yawk attitude !! PES, the genius that created this stop motion, has a fantastic YouTube channel - GO THERE!! H/T Hotel Marketing Strategies for publishing the tips. Next Gen #BusinessClass airline seats direct connect to your 'data footprint' to predict what services and entertainment options you prefer. 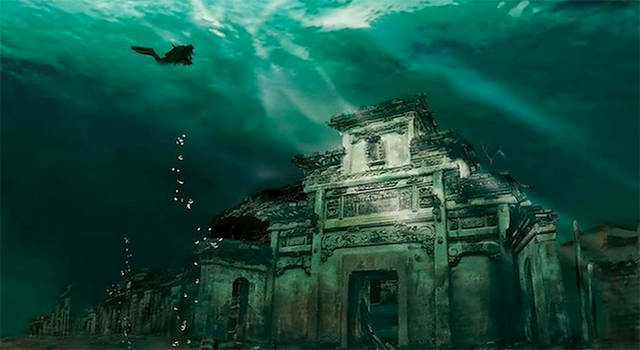 +Avodah Visa vous présente la cité perdue sous-marine "Lion City"
La ville englouti est Shi Cheng qi a été construite il à plus de 1300 ans, elle se retrouve désormé sous le lac #Qiandao qui est un lac artificiel construit en 1959. La ville fut oublié durant 40 ans . +Avodah Visa en ligne espère vous avoir donné envie de découvrir un lieu magique de la chine. Estas analizando tu Web o tu Blog y no sabes por donde empezar? Se ha hablado mucho de tener calidad de contenido! Perooooo que significa? El contenido es la habilidad de una empresa para comunicar de manera efectiva con sus clientes existentes o posibles de manera significativa. Google clasifica ahora los sitios en función a la calidad e importancia del contenido. Por lo tanto, ahora no solo es importante generar contenido por generarlo, o sôlo con el objetivo de influenciar SEO o aumentar nuestras visitas. Es necesario generar contenido que sea interesante, claro y llamativo para nuestros lectores o posibles clientes. ¿Estas dando a tus clientes la información que ellos están buscando? 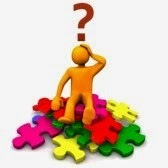 ¿Los datos que proporcionas permiten a tus posibles clientes tomar una decisión final de compra? ¿La manera en que presentas la información es atractiva para tus clientes? ¿Los beneficios que ofreces a tus clientes están claros en el contenido que generas? Al enfocar tus esfuerzos en generar contenido de calidad interesante y atractivo, te ayudas tu mismo a mantener tu visibilidad en lînea, tendrás una gran ventaja sobre tus competidores, a fidelizar tus clientes existentes y conseguir nuevos clientes. ¿Por qué hablamos de contenido Visual? Puedes utilizar CANVA una herramienta en linea que te ayuda a mejorar tus imagenes y presentaciones.